Fuzzy Buds and Snow Removal; Where’s the White Cat? Did the cheery looking box of “Mickey Mouse” adhesive bandages my friend Bill handed me actually contain adhesive bandages? No. Instead, fuzzy green buds spilled out. An illicit drug? No, again. Those “buds” were sweet fern seeds, which Bill suggested planting. Sweet fern (Comptonia peregrina) is a native plant, one of my favorites, valued for its resinous aroma. That aroma always transports me in time back to summer days hiking in the White Mountains along sunny, dirt roads lined with sweet fern when I was nine years old. Poor (but well drained) soil and hot afternoon sun bring out the best in sweet fern. The plant makes do in poor soil by getting its nitrogen from the air with the help of a symbiotic microorganism. Sweet fern is attractive even if it lacks the flamboyance of showy flowers or colorful leaves. Picture clumps of 3-foot-high stems clothed in dark green fern-like leaves. “Fern-like” because sweet fern is not, in fact, a fern but a member of the Myrtle family, along with bayberry. So, yes Bill, I would like to grow sweet fern. But I have reservations about starting it from seed. The seed retains its viability for decades but sprouts only after jumping through a few hoops. Old seeds that have been lying dormant in the soil, perhaps for decades, sprout readily. 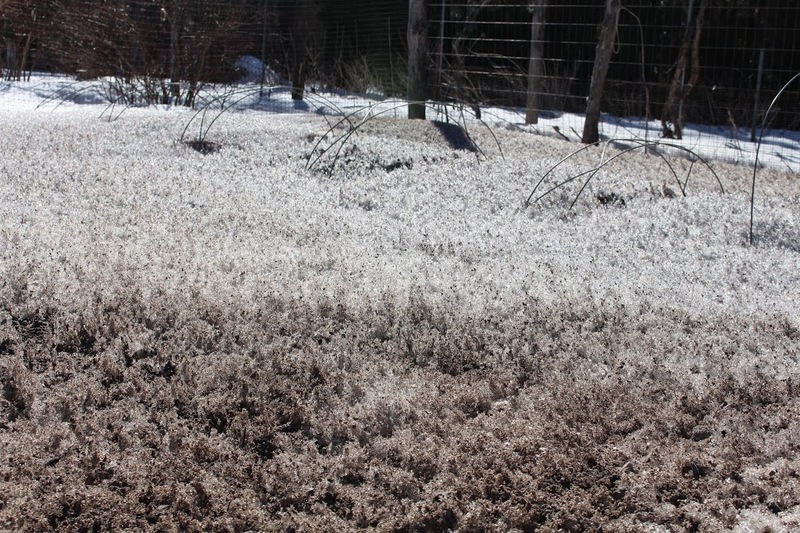 Over time, their seed coats have been softened, chemical inhibitors have been leached away, and a spate of cool weather has reassured them that winter is past and it’s safe to sprout. To get seeds to sprout in a more reasonable time, the seed coats need to be scarified, or made permeable. 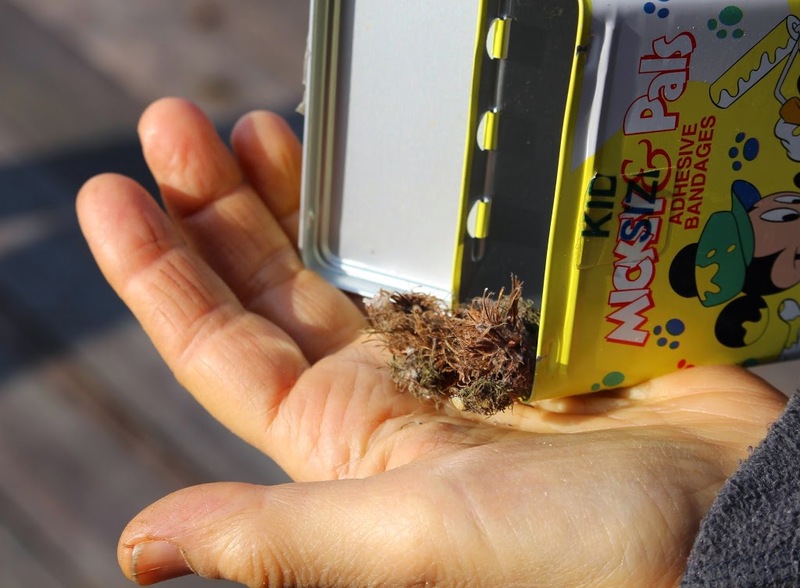 Nicking the seed with a wire cutter, rubbing it with sandpaper, or soaking it in sulfuric acid will do the trick but care must be taken to avoid damage. Mixing the seeds with moist potting soil and refrigerating it for a month or two gives it the chilling required. After that, greatest success in germination comes with soaking the seed in a solution of gibberellic acid, a plant hormone. You know what? I’m not going to bother with the seeds. Sweet fern is easily propagated from rhizome (root-like subterranean stem) cuttings — as long as I can find someone with sweet fern who will let me take a few cuttings. All that’s needed is to dig up some of the shallow, horizontal rhizomes, cut them into 2 to 4 inch lengths (the longer pieces for the thinner rhizomes), and set them 1/2” deep in a mix of equal parts peat and sand or peat and perlite or just vermiculite. New roots and shoots will develop and, this summer I could imagine that I am again walking along again in my white T-shirt with a pack on my back, canteen at my side, and Ked’s sneakers on my feet, wafting in that delicious aroma from along a sun-parched road. Much, much easier to grow from seeds than sweet ferns are peas. If I can only get out in the garden to plant them! The time to sow peas around here is April 1st but — as I write this on March 19th — night temperatures are in the ‘teens and the garden sleeps beneath a blanket of snow. The reason to rush peas into the ground as soon as possible is because the bearing plants don’t like hot weather. The earlier they get into the ground, the sooner they begin to bear. Once weather turns torrid, I pull the peas out and plant bush beans, fall cabbage, or some other vegetable where they stood. The reason I don’t plant peas on St. Patrick’s day is because, first of all, it would be hard to plant in usually frozen ground. Also, peas don’t germinate until soil temperatures hit 40°F. If they just sit in cold, moist soil without sprouting, they’re apt to rot. No need to twiddle my thumbs waiting for the soil to warm. 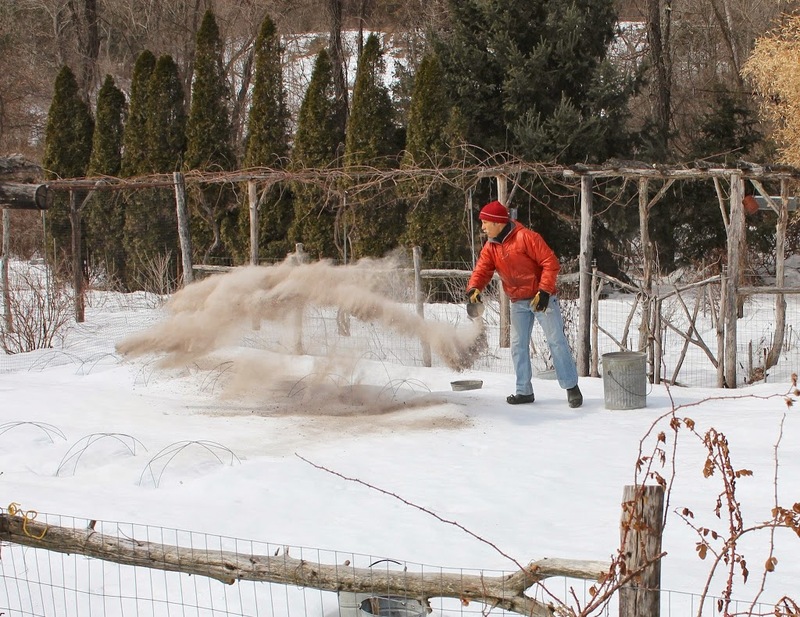 Sprinkling some wood ash on the garden should hasten soil warming. The ashes hasten disappearance of the snowy blanket both from a “salt” effect (from the mineral salts, not sodium chloride, in the wood ash) and from their dark color. Wood ash also helps nourish garden soils, making the soil less acidic and adding potassium and a slew of micronutrients. But restraint is needed to avoid too much of a good thing. Excess potassium or alkalinity ends up feeding plants an imbalance of nutrients. The mere dusting I spread a few days ago began its work quickly, soon pitting the surface to look like a miniature range of jagged mountain peaks. (Update: The snow, since I initially wrote the above, has thoroughly melted except in a few shaded areas. Nothing like a few 50 degree days to make spring’s presence finally known. This entry was posted in Uncategorized and tagged peas, snow, sweet fern, wood ashes. Bookmark the permalink. Trackbacks are closed, but you can post a comment. We plant peas when we hear the peepers. In other years we would have heard them by now, but the ground isn’t all the way thawed yet. I think they start peeping when the soil is above 40F. Excellent! That sounds about right, and I heard peepers yesterday. No, that IS right. I just checked the soil temperature and it’s 40°F. Thanks for the tip. I’ve been reading some of your older posts. Last year, you bemoaned ordering a camellia and an apricot. What happened to them? Here is my tiny zone 6B garden, my two camellias miraculously survived our hellacious winter with buds intact (knocking wood furiously). Can’t wait. The apricot is fine. Cold winters aren’t the main problem with apricot. The main problems are late frosts in spring killing buds an then, of course, insects and diseases attacking fruits. I haven’t checked the camellia yet but it should be fine because it was very small so was beneath a warm blanket of snow all winter. Yay Spring is here! I hope to plant my peas this week. I have planted them as early as St. Patrick’s Day but definitely not this year! I still have some patches of snow but mostly I have a soggy mess. I have wanted to try Sweet Fern but I think I don’t have enough space – would be interested in seeing it your gardens! Sweet Fern plants are available through Prairie Nursery in WI (prairienursery.com) – I buy a lot of natives through mail order. They will begin shipping in May.